Canadian dressage athletes snapped up top spots in all divisions this past weekend, 5 - 8 June 2014 at the 2014 CDI-W Palgrave. The official test event for the 2015 Pan American Games, was held at the Caledon Pan Am Equestrian Park in Palgrave, ON. 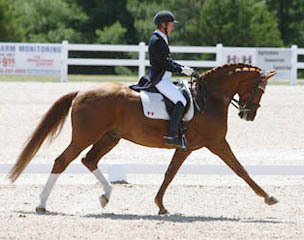 Canadian Olympian David Marcus of Campbellville, ON, and his 2012 Olympic mount Chrevi's Capital (by Chrevi's Cavallo x Weinberg), Deborah Kinzinger-Miculinic's 14-year-old Danish Warmblood gelding, took first place winning the Grand Prix class with a score of 69.980%. Coming in close second was fellow Canadian Megan Lane of Loretto, ON and her horse Caravella, a Canadian-bred 13-year-old Dutch Warmblood mare (by Contango x Riverman) with a final score of 69.900%. In addition, both Marcus and Lane have now met the Canadian selection criteria for the 2014 World Equestrian Games being held this summer in Normandy, FRA and are the first two Canadian dressage athletes to successfully fulfill the criteria. Riders needed to achieve four scores of 68% in the Grand Prix test in a CDI competition one of which must be achieved in either May or June. "This Grand Prix test was very important for us as a successful score would help us to fulfill the final stage of the criteria for WEG," said Marcus. "I am very happy with how Capital went, and I believe he deserved every point he got. I felt the test was very harmonious, and was highlighted by some of the best piaffes we have had in the ring." "I am proud of him and our partnership, and I am looking forward to seeing him continue to improve in his performance and scores as the summer progresses," added Marcus. Jill Irving of Moncton, NB and Degas 12, a 12-year-old Hanoverian gelding, sired by De Niro, finished third for Canada earning a final score of 68.540%. Belinda Trussell of Stouffville, ON rode Anton (by Antaeus x Melit), a 14-year-old German-bred gelding owned by Robyn Eames to fourth place with their score of 66.940%, while Diane Creech of Caistor Centre, ON rounded out the top five with Devon L, a 14-year-old Hanoverian gelding (by De Niro X Wolkenstein II) owned by D.W. Leatherdale and Leatherdale Farms. Tom Dvorak of Hillsburgh, ON and Viva's Salieri W, Augustin and Christine Walch's 13-year-old Hanoverian stallion sired by Viva Voltaire won the Grand Prix Special with their score of 66.800% while Diane Creech and Devon L danced to first place in the Grand Prix Freestyle scoring a personal best of 75.100%. "It was a very exciting phone call to make to my owners, Mr. and Mrs. Leatherdale. They are so proud of the accomplishment of winning this big event," said Creech. "Devon was breathtaking. He had so much power and still all the focus he needed. We had no mistakes and it was so much fun. I just love my music from Karen Robinson, who did an exceptional job of putting it together. I especially enjoyed riding and winning in front of our home spectators." "The fundraising event from CDAAP was incredible and I want to thank Deborah Kinzinger-Miculinic and everybody, who helped to make this happen. If winning the honour of this freestyle was not the only exciting moment, after ribbon presentation we all received a special prize sponsored from Butternut Ridge Farm. I won a big screen TV. This is so generous from Mrs. Kinzinger-Miculinic. I really want to thank her and Desi Dillingham for making us feel special," Creech continued. Trussell and Anton came in second place on their score of 72.350%. Lane rode Caravella to third place with 71.800 and Brooks and D Niro claimed fourth with 71.675%. Rounding out the top five Canadian performances were Brittany Fraser of New Glasgow, NS and Countess, her own 11-year-old Danish Warmblood (Donnerhall x Solos Landtinus) earning a final score of 70.150%. Six-time Canadian Olympian, Christilot Boylen, a Toronto, ON native who has been residing in Europe, took first place in the Prix St. Georges riding Florencia, Jill Irving's eight-year-old Hanoverian mare (by Florencio I x Weltmeyer) with a final score of 69.825%. Trussell and Tattoo 15, her 11-year-old German Westphalian gelding (Tuareg x Ramiro's Son) earned a final score of 69.693% giving them second place and Denielle Gallagher of Lakeside, NB rode Evi Strasser's Argo-Conti Tyme, a 12-year-old Oldenberg stallion (Agentinus x Continue) to third on their score of 68.114%. Andrea Bresee of Uxbridge, ON was fourth with a score of 66.096% riding Diaz, her 10-year-old Hanoverian gelding (Distelzar x Wolkenstein II). Rounding out the top five for Canada were Maya Markowski of St. Clements, ON and Diego, her nine-year-old Hanoverian gelding (Der Lord x Wolkenstein II) with their final score of 66.053%. In the Intermediate I division, Trussell and Tattoo 15 took first place with 73.509%, Boylen finished in second with Florencia earning a score of 69.605%. Partnered with Ribot (Reno x Cor Noir), a 12-year-old Oldenburg gelding owned by Carla Bahr, Tom Dvorak of Hillsburgh ON, earned 68.728% for third place and Gallagher and Argo-Conti Tyme landed fourth with 67.325%. Markowski took fifth on Lumiere, her 11-year-old Canadian Warmblood gelding sired by Heike II. Gallagher and Argo-Conti Tyme took first place in the Intermediate I Freestyle earning a score of 71.1670%; Dvorak took second with Ribot on 71.000%. Simone Williams of Navan ON, and Farley, her 10-year old Hanoverian gelding (Falsterbo X Rubirando) came in third place scoring 68.125%, while Lee Taylor of Orton, ON riding Cedar's Padraig, her 16-year-old Connemara gelding (Ridgetop O'Rian X Grange Finn Sparrow) landed fourth on a final score of 67.375%. Markowski and Lumiere finished in fifth. Junior Rider competitor Alexandra Meghji of Toronto, ON and Iliado II, a nine-year-old Andaluzian owned by Diana Belevsky, won two of their three tests, taking first place in the Team Championship with her score of 70.000% and in the Individual Test scoring 68.728%. Meghji closed out her weekend taking third place in the Freestyle earning a final score of 68.500%. Liza Wilson of Markham, ON rode to second place in the Team Championship Test (68.333%) and in the Individual Test (68.509%), and first in the Freestyle (69.875%) riding Fleurina, her 16-year-old Westphalian mare. Tanya Strasser-Shostak of Ste. Adele QC swept the Young Rider division taking first place across the board atop Evi Strasser's Action Tyme, a 14-year-old Oldenburg gelding, the pair earned 68.070% for their Championship Team Test, 67.456% in their Individual Test and scored 69.542% for their Freestyle performance. The ground jury for the event consisted of Ground Jury President Lilo Fore USA FEI 5*, Lois Yukins USA FEI 4*, Sandra Hotz USA FEI 3*, Marian Cunningham Peru FEI 4*, Lorraine Stubbs CAN FEI 4*, Lorraine Macdonald CAN FEI 4*, Anne Prain FRA FEI 4*, Freddy Leyman BEL FEI 4*, and Chief Steward Linda Miller CAN FEI 2* with Anne Welch CAN FEI 1*, Leslie Kennedy CAN FEI 1*, Lynn Milford CAN FEI 1* and Jane Holbrook CAN FEI 1*.